Deck the balls with rows-of-pup-pies, fa la la la la-lalalalaaa! We’re so happy our holiday party was a hit! Biscuit and Dakota pose with three ladies that can’t get enough of them. We asked for their autographs, too. Last Saturday, Waggit and our pals from School for the Dogs held a jolly get-together at their training spot in the East Village neighborhood of New York. Serving up some mini hotdog pastry puffs, sparkling apple cider, and a slew of dog friendly giveaways, humans with pinkies and dogs with paws had a great time hanging out, chatting about our dogs, and taking in some holiday cheer. Dressed up in his festive red hoodie, Amos, the resident pup at School for the Dogs was a very gracious host. Thanks for sharing your dog house with us, Amos! Some of the many prizes were a Waggit t-shirt, a bottle of Hudson Valley Whiskey, a 3-month Barkbox subscription, and free dog-training lessons by Anna Grossman, lead trainer at School for the Dogs. Not too shabby, if you ask us! We also gave out bags of Old Mother Hubbard Dog treats. Did you know that over 80 years ago, Old Mother Hubbard was originally made for sailors, but ended up being more popular as a treat for dogs? I guess that means the treats really ARE good enough to eat! If you don’t believe us, read more about the Old Mother Hubbard story here. Old Mother Hubbard, BarkBox and Waggit sharing some holiday joy. Oh, don’t forget the poop bags. 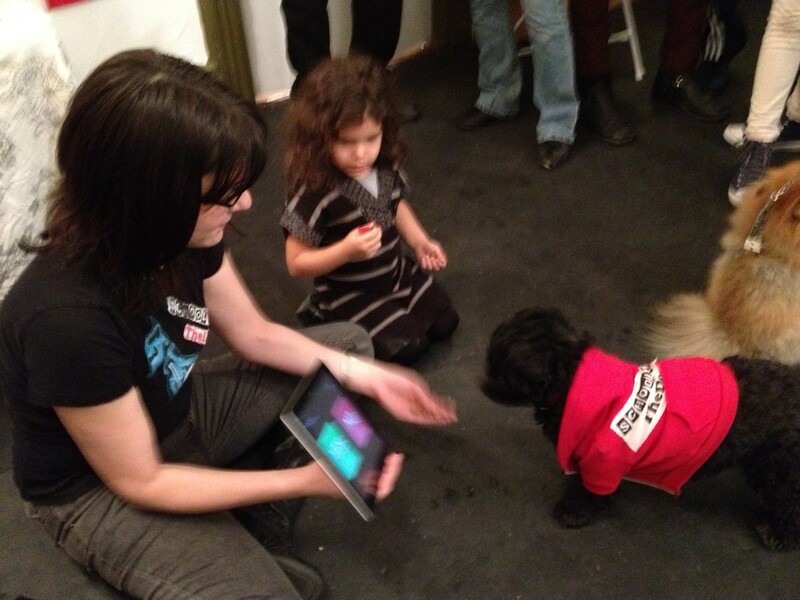 One of the highlights of the party was when Anna shared her dog training expertise in positive reinforcement. The combination of treats and repetition taught Amos how to use an iPAD! Amos using an iPad to answer some “Yes” or “No” questions. “Hey Amos, am I the prettiest girl in the entire world?” Despite his sometimes brutal answers, we know they were 100% honest. For more pictures from the Deck the Balls Party, come like our Waggit facebook page. We promise to brighten up your day with cute and uplifting dog photos. It’s also a great way to keep up with all that’s going on in the world of Waggit. Anyone interested in another party around Valentines Day? Craving some puppy luv? Let us know and we’ll make it happen.